When your garage door extension springs break or come unhooked, your door could become entirely inoperable. At home, this is just an inconvenience, but it can actually impact your sales and your earnings if you have a commercial door. Sometimes, the springs will come apart due to a botched garage door opener installation. Do you need to hire someone for a door springs installation project, replacing the springs that you owned before? If so, you will be glad to know that we are fully qualified for work on garage door extension springs at All About Doors. Damage other parts of the door. Injure those who are nearby. Cause the door to stop functioning completely. Drive the repair costs up. It is more expensive to have the springs and opener installation job carried out to replace parts than it is just to have those parts checked once a year by our preventative maintenance experts. We have done thousands of door springs installation jobs, putting in garage door extension springs in residential, industrial, and commercial settings. We are experienced with parts and maintenance as well, so we can provide upkeep for the doors after we get them working again. 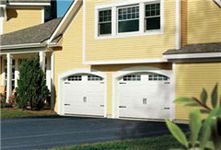 Would you like to find out which garage door springs we carry? Would you like a free quote for a springs and opener installation job? For anything to do with garage door extension springs, please call us now at (410) 777-5397.